What I built can be used to graph anything within webcore and create annotations on these graphs. I find it very useful for measuring battery, temperatures, see people coming in and out, etc. The imagination is the limit. Man, I am a fuel-stream-junkie, with 34 active graphs at the moment. Does your method require a PC to be left on 24/7? Yes, it does. I’m currently trying to get this functional using a raspberry pi, which just sits in a closet and runs 24/7. That’s correct. I run all this in Docker containers on my NAS which is not much more powerful than a raspberry Pi. A $30 RPi 3 could do the job nicely, for sure. I have webcore pistons that create annotations for washer done (on the power graph), dryer done (a multipurpose sensor temp graph), and an annotation range for when no one is home. E.g. can see how much power usage or lights are on when no one is home. I have other Influxdb/grafana dashboards for ecobee data (pulled through python scripts), raspberry pi collectd data, and network useage (scripts on the AsusWRT router). Don’t get started on this - it’ll consume you! So I got @ferik’s webcore-proxy working. Took me awhile as I’m new’ish to using nodejs/npm. Also used PM2 http://pm2.keymetrics.io/docs/usage/quick-start/ to start everything up and keep it organized. good job, we’ve been doing very similar things. It’s funny that we ended up with a very similar presence graph without consulting each other. How do you send the presence, as a gauge? 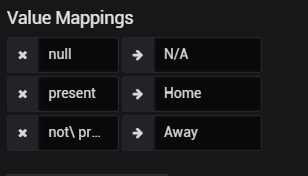 I use 0 and 1 for gauges, how do you have Grafana show them as Home/Away? Oh - and I do have annotations. The blue bar under the “lights in use” and “power usage” are range type annotations. And point-in-time for things like “washer finished” which isn’t in the current time range. 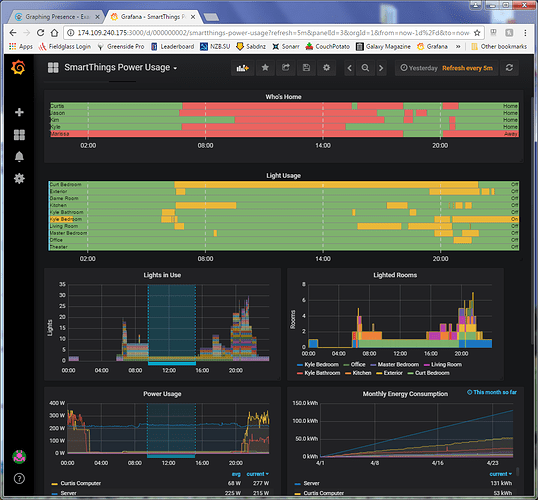 Can you share your Grafana dashboards, @milhouse ? Happy to. Not sure of the best way for you to make use of it, though. Save dashboards to JSON file? Share link? I think you’d need a login. Heck, PM me with your email and I can even make you a viewer login. You tell me what format you’d prefer. Can’t attach it here, seems to only accept image files. Here’s the text of the JSON. I have only one dashboard for SmartThings. Other dashboards are network (router scripts + sabnzb), raspberry pi (collectd), and thermostat (ecobee scripts). I can attach those if there is interest, as well. I’ve never tried to use someone else’s Grafana dashboard, am curious how useful it is. Published snapshots here, too. It’s a shame the discrete panels don’t work on the snapshot. They’re my favorite. Nor do the time overrides - I have several panels that are month-to-date. Let me know if you’d like more detail. As I said, happy to give you a read login if you PM me. Thanks @Milhouse, I’ve assembled a few things, looking at what you’ve done too. @milhouse - the forum did a number on the JSON file. I tried to fix it by hand but there were hundreds of issues. Could you send it via https://send.firefox.com ? Or maybe escaping the text with a markdown triple-` would work? Edited post above - just shared from my Google drive. Firefox share didn’t seem to work, and would expire in 24 hours anyway. Hopefully this version will work better! Glad it’s of use to you! Yeah, that InfluxDB Logger smartapp is really easy to use. Post some pics of your graphs when you’ve got them, especially if you’ve got any unique ones I haven’t thought of. Mine are all a bit of a dumping ground to see what I can do with Grafana and the data I’ve got. Not all are useful. Let me know if you are curious about any of my WebCore pistons that actually post the annotations to Grafana.